The New York stop of The Human Rights Watch Film Festival, June 11 to 21, 2015, at the Film Society of Lincoln Center and the IFC Center, provided intense, close-up views of some of the worst problems people inflict on people in the United States and around the world, while seeking solutions, justice, and attention. One unifying theme of many of the worthwhile feature documentaries is the scourge of violence, both in the present and how it reverberates from the past. In its New York premiere, this timely, intense examination of one killing of an unarmed African-American teenager serves as a revealing case study of justice grappling with the lethal intersection of racism and guns, and the intimate impact on all those involved. The Black Friday 2012 killing at a Jacksonville, Florida gas station made national headlines. Did white, middle-aged Michael Dunn really kill 17-year-old Jordan Davis for playing music too loud? With his story changing a few times, Dunn justifies himself during police interrogations after his arrest the next day, that with the radio blaring hip hop and the four teens mouthing off to him, he was sure he saw one reaching for a weapon and claimed his hail of bullets into the SUV next to his car, in the titular three-plus minutes, was in self-defense because he feared for his life. Florida is fertile territory for observing the culture wars, what with its Southern redneck traditions, large minority population, aggressive gun ownership, and “Stand Your Ground” laws (that have now spread to 32 other states), plus the state permits cameras in the courtroom, even allowing director Marc Silver’s additions to the regular media pool. The trials are suspenseful, as the defense lawyer hones in on Dunn’s perceptions, creating reasonable doubt that just because the police didn’t find any weapon doesn’t mean the teens didn’t have one. Outside of court, Silver delves beneath the stereotypes that touched off the fatal encounter, including emotionally revelatory phone calls between the imprisoned Dunn and his fiancée, who becomes a traumatized witness. Contrary to Dunn’s assumptions, Jordan’s friends provide important peer context as we get views the jury doesn’t of their home suburb. His devastated parents are extensively interviewed before, during, and after the trial, though Abigail Disney’s parallel The Armor of Light, which world premiered at the recent Tribeca Film Festival, also focused on their same grief-stricken memories, family photos, and determined drive for justice. The organized violence by cartels on both sides of the U.S./Mexico border has generated organized vigilantes frustrated by government response. Director Matthew Heineman embedded for five months with their quasi-military activities to reveal up-close, in what he calls “run-and-gun verité”, capturing both the positives of their grassroots community organizing and their far scarier prejudices and resulting anarchic corruption. At this year’s Sundance Film Festival, Heineman was awarded for Directing and Cinematography in the U.S. Documentary competition. In the U.S., he follows Tim "Nailer" Foley, a hard-bitten, tattooed vet, who heads the armed volunteer Arizona Border Recon, found through a Rolling Stone story on “Border of Madness”. While first Foley is out on night patrols in the desert to stop illegal migrants, who he refers to in colorfully derogatory terms, let alone what he thinks of the Federal government, he visibly softens to the pitiful individuals and turns his wrath on the cartels profiting off their hopes and miseries, and the drug violence they are bringing north. Though these scenes are formless and wandering, it is fascinating as he explains, in military tactics and strategic terms, how he seeks out the spotters who navigate the routes and carries out blocking them to impact the cartels financially. And if you think nonviolent efforts should be tried, Bill & Turner Ross’s Western shown at this year’s New Directors/New Films of Film Society of Lincoln Center/MoMA, and still making the festival rounds, shows people on both sides of the border who are risking their lives for peace and progress -- with similar results. Violence magnifies Faulkner’s warning that “The past is never dead. It's not even past.” in three documentaries for the people caught up in wars. So many recent war films -- fiction features (such as Brothers) and documentaries (such as The Kill Team) -- talk about U.S. veterans are suffering from Post-Traumatic Stress from America’s longest war. But French director Laurent Bécue-Renard shows someone actually doing something effective about it – of veterans, for veterans, and by veterans. At The Pathway Home, a residential facility in northern California, therapist Fred Gusman finds intensive sessions of peer group therapy, where they can finally feel free to weep and yell, can help them work out their demons into individual therapy, and prepare for smoother re-integration in society they all desperately want to achieve. Key is how they share and break through the stoic military ethos that is antithetical to opening up to heal. In riveting emotional turns, they recount, for the first time, what they went through, and admit how the violence haunts them, whether what they had to do, or what was done to them and their friends. One describes still feeling like “a hostage to the war zone”. For some it takes several tries to even stay in the room. In this second of his “Genealogy of Wrath” trilogy (Part 1 was Living Afterwards: Words of Women (2001) on the psychological damages of the Balkan Wars on Bosnians. ), Bécue-Renard was inspired by his grandfathers’ emotionally damaging silence about their World War I experiences and hope that other families won’t have to suffer. Involving the participants’ families, he also filmed at several veterans’ homes to get their families’ reactions. At the North American premiere at the Museum of Modern Art, one of the grateful participants attended in his full dress uniform to proudly demonstrate that the months of therapy enabled him to continue to serve in the Reserves. The government’s palpable fear that the violence of war can hit home gets very personal in this startlingly intimate portrait of an informant honing in on a potential terrorist, like we’ve only seen in fictionalized features on undercovers with gangs and organized crime syndicates that have actual records of violence. (He says he prefers to think of himself as a “civilian operative”.) It’s not only eye-opening how the man who calls himself “Shariff” follows FBI instructions to not only insinuate himself with a Pittsburgh mosque attendee who is suspected of Al Qaeda sympathies, but to do so where the target can be taped, very much like the informant heard leading on four young black men in last year’s The Newburgh Sting. A bit lackadaisical in his Muslim observance, the FBI has to even press him to keep going to the mosque. 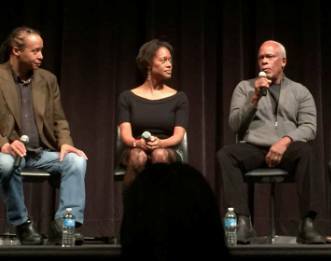 Director Stanley Nelson’s unique history, the Film Festival’s Closing Night selection, is useful and informative background for insight into how a former Black Panther like “Shariff” could go through such changes, and how government informers impacted The Movement, foreshadowing their questionable function now. In addition to diligent research that found an extraordinary range of archival footage back, year by year from 1966, across many cities, along with TV news clips and newspaper articles, and rare illustrations and photographs, the frank narration is all interviews with former, gray-haired Panthers from across the country (many have written memoirs). Julian Bond, who must be busy full-time with such documentaries, is also interviewed to give the perspective of SNCC (Student Nonviolent Coordinating Committee, Tom Hayden on the Students for Democratic Society (SDS), as well as an ex-agent about the FBI’s point-of-views. Many of their priorities are startlingly still relevant, such as demands for full employment and teenage boys “gunned down” by police.